A Cisco router goes through its startup when it is first turned on and there is no configuration saved. When the startup is completed, you can enter the initial software configuration. Recognizing correct router startup is the first step in installing a Cisco router. The router must start successfully and have a valid configuration to operate on the network. This lesson describes how the router starts up and explains how to verify its initial operation. When a Cisco router powers up, it performs a POST. During the POST, the router executes diagnostics to verify the basic operation of the CPU, memory, and interface circuitry. After verifying the hardware functions, the router proceeds with software initialization, during which it finds and loads the Cisco IOS image, and then finds and loads the configuration file, if one exists. Your terminal is connected to the console port. Your console terminal application, such as HyperTerminal, is selected. Step 2 Push the power switch to “On” or plug in the device if there is no On/Off switch. Step 3 Observe the boot sequence and the Cisco IOS Software output on the console. When the router starts up, it looks for a device configuration file. If it does not find one, the router executes a question-driven initial configuration routine, called “setup.” Setup is a prompt-driven program that allows a minimal device configuration. After a router completes the POST and loads a Cisco IOS image, it looks for a device configuration file in its NVRAM. The NVRAM of the router is a type of memory that retains its contents even when power is turned off. If the router has a startup configuration file in NVRAM, the usermode prompt appears after entering the console password, if one has been set. When starting a new Cisco router, there is no configuration file. If no valid configuration file exists in NVRAM, the operating system executes a question-driven initial configuration routine, referred to as the system configuration dialog, or setup mode. 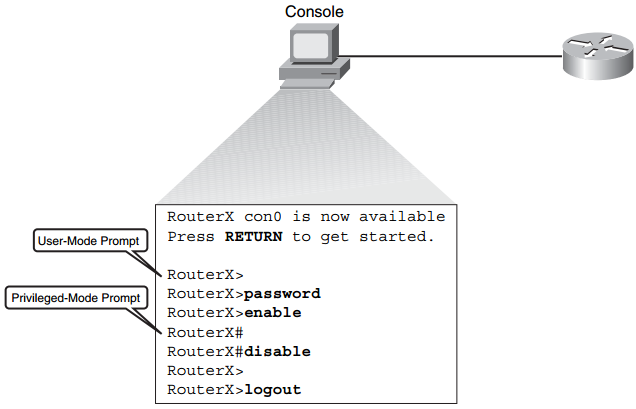 Setup mode is not intended for entering complex protocol features in the router. Use setup mode to bring up a minimal configuration. Rather than using the setup mode, you can use other various configuration modes to configure the router. The primary purpose of the setup mode is to rapidly bring up a minimal-feature configuration for any router that cannot find its configuration from some other source. Setup mode can be entered when the router boots up without a configuration, or it can be entered at any time after the router is booted and operational, by entering the setup privileged EXEC mode command. Example 4-1 shows how to enter setup from the privileged EXEC mode prompt. For many of the prompts in the dialog of the setup command facility, default answers appear in square brackets ([ ]) following the question. Pressing Enter allows the use of the defaults. When prompted with “Would you like to enter basic management setup?” the system configuration dialog can be discontinued by entering no at the prompt. To begin the initial configuration process, enter yes. Normally, you enter no at the “basic management setup” prompt so that extended setup can be entered to configure more specific system parameters. Pressing Ctrl-C will terminate the process and start over at any time. When using the command form of setup (Router# setup), Ctrl-C returns to the privileged EXEC prompt (Router#). If you enter yes at the “Would you like to enter basic management setup?” prompt, you are prompted with “First, would you like to see the current interface summary?” Enter yes to view the router interfaces. Example 4-2 shows the output indicating the current status of each router interface. This information includes the interface IP address and current configuration. Continuing through the setup dialog, you are prompted for global parameters. Enter the global parameters at the prompts, using the configuration values that were determined for the router. The first global parameter sets the router host name. This host name will precede Cisco IOS prompts for all configuration modes. The default router name is shown between the square brackets as [Router]. Use the next global parameters shown to set the various passwords used on the router. Example 4-3 illustrates the default settings in brackets and shows entering global parameters. modes. This password, after entered, becomes encrypted in the configuration. older software versions, and some boot images. Continuing through the setup dialog, you are prompted for additional global parameters. Enter the global parameters at the prompts, using the configuration values that were determined for your router. The example shows the prompts for routing protocols as they appear during setup. If you enter yes at a prompt to indicate that you want to configure a protocol, additional subordinate prompts appear about that protocol. Example 4-4 illustrates this feature. Continuing through the setup dialog, you are prompted for parameters for each installed interface. Use the configuration values that were determined for the interface to enter the proper parameters at the prompts. Example 4-5 illustrates the configuration of interface FastEthernet 0/0. CAUTION Cisco AutoSecure attempts to ensure maximum security by disabling the services most commonly used by hackers to attack a router. However, some of these services might be needed for successful operation in your network. For this reason, you should not use the Cisco AutoSecure feature until you fully understand its operations and the requirements of your network. When you complete the configuration process for all installed interfaces on the router, the setup command shows the configuration command script that was created, as shown in Example 4-6.
: Go to the EXEC prompt without saving the created configuration. : Go back to the beginning of setup without saving the created configuration. : Accept the created configuration, save it to NVRAM, and exit to the EXEC mode. If you choose , the configuration is executed and saved to NVRAM, and the system is ready to use. To modify the configuration, you must reconfigure it manually. The script file generated by the setup command is additive. You can turn features on with the setup command, but not off. In addition, the setup command does not support many of the advanced features of the router or those features that require a more complex configuration. When you configure a Cisco router from the CLI on a console or remote terminal, the Cisco IOS Software provides a command interpreter called the EXEC. The EXEC interprets the commands that are entered and carries out the corresponding operations. You must log in to the router before entering an EXEC command. After you have configured a Cisco router from the setup utility, you can reconfigure it or add to the configuration from the user interface that runs on the router console or auxiliary port. You can also configure a Cisco router using a remote-access application such as SSH. User mode: Typical tasks include those that check the router status. Privileged mode: Typical tasks include those that change the router configuration. When you first log in to the router, a user-mode prompt is displayed. EXEC commands available in user mode are a subset of the EXEC commands available in privileged mode. These commands provide a means to display information without changing router configuration settings. To access the full set of commands, you must enable the privileged mode with the enable command and supply the enable password, if it is configured. NOTE The enable password is displayed in clear text using the show run command. The secret password is encrypted, so it is not displayed in clear text. If both the enable and secret passwords are configured, the secret password will override the enable password. The EXEC prompt then displays as a pound sign (#) while in the privileged mode. From the privileged level, you can access global configuration mode and the other specific configuration modes, such as interface, subinterface, line, router, route-map, and several others. Use the disable command to return to the user EXEC mode from the privileged EXEC mode. Use the exit or logout command to end the current session. Figure 4-25 illustrates the navigation through these modes. You can enter a question mark (?) at the user-mode prompt or the privileged-mode prompt to display a list of commands available in the current mode. Example 4-7 shows help at the user-mode prompt. NOTE The available commands vary with different Cisco IOS Software versions. Press the Spacebar to display the next available screen. Press the Return key (or, on some keyboards, the Enter key) to display the next line. Press any other key to return to the prompt. Enter the enable user-mode command to access privileged EXEC mode. Normally, if an enable password has been configured, you must also enter the enable password before you can access privileged EXEC mode. Enter the ? command at the privileged-mode prompt to display a list of the available privileged EXEC commands. Example 4-8 shows privileged-mode help. After logging in to a Cisco router, the router hardware and software status can be verified by using the following router status commands: show version, show running-config, and show startup-config. Use the show version EXEC command to display the configuration of the system hardware, the software version, the memory size, and the configuration register setting. Example 4-9 shows the output from a show version command. Cisco 2811 (revision 53.50) with 249856K/12288K bytes of memory. In the example, the RAM is assigned with 249,856 KB available for main memory and 12,288 KB available for I/O memory (shared by all the interfaces). The I/O memory is used for holding packets while they are in the process of being routed. The router has two Fast Ethernet interfaces and two serial interfaces. This is useful for confirming that the expected interfaces are recognized at startup and are functioning, from a hardware perspective. The router has 239 KB used for startup configuration storage in the NVRAM and 62,720 KB of flash storage for the Cisco IOS Software image.